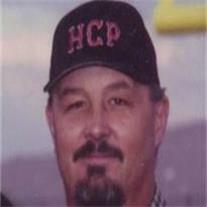 Roger Dell Moore, resident of Gilbert, AZ passed away suddenly on December 11, 2012, at the age of 44. Roger was born on March 18, 1968, in Chandler, Arizona. Roger lived in the valley most of his life. On November 24, 1990, he married his eternal companion Kimberlee Hudson whom he was sealed to for time and all eternity in the Arizona Temple. They had three beautiful boys together. In 2006 they moved to Prescott Valley where they created many fond memories. They moved back to Gilbert in June of this year. Roger was a loyal man and loving husband and father. He was a plumber by trade but was better known for his awesome cooking skills. He is survived by his wife, Kimberlee and three sons whom he was extremely proud of: Wyatt 18, Truman 16, and Hudson 13. Also surviving are his father Frank Moore of Batesville, AR, brother Hank of Hot Springs, AR, two sisters Beverly Lopez (Louie) of AZ and Barbara Witherite (Amy) of Dallas, TX. He will be missed more than he could ever imagine by his family and friends. A memorial fund has been set up through both Compass Bank and Wells Fargo in hopes of raising money for the family. Anything will help his surviving wife and 3 boys. The account at Compass Bank is 670 291 8292 under the name of Michael Hudson (brother to Kimberlee) and at Wells Fargo under Roger Moore, account number 1739145629. Visitation is Friday, December 14, 2012 from 6-8 PM at Bunker’s University Chapel, 3529 East University Drive, Mesa, 85213. Funeral services Saturday, December 15, 2012 at 10 AM, preceded by a visitation at 9 AM at the LDS Western Skies Ward, 1155 East Ray Road in Gilbert. Interment will follow at Mountain View Memorial Gardens, 7900 East Main Street in Mesa.